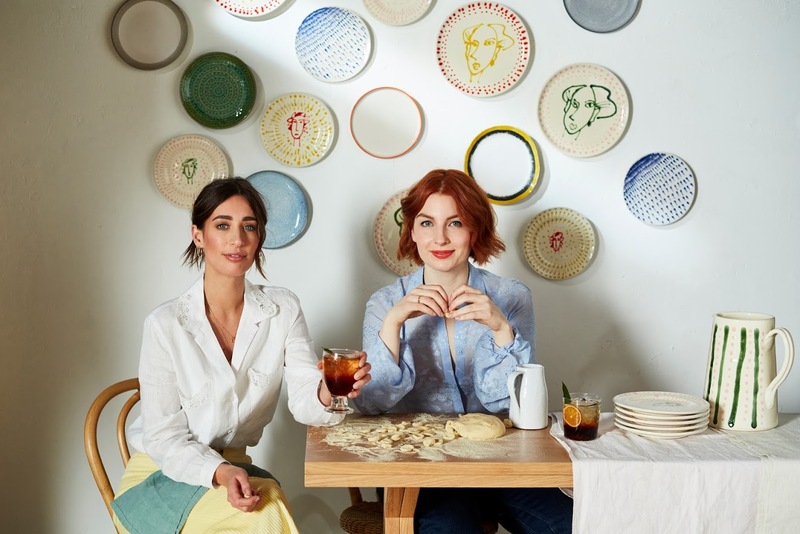 Who better to ask dining interiors advice from than successful lifestyle duo Laura Jackson and Alice Levine? 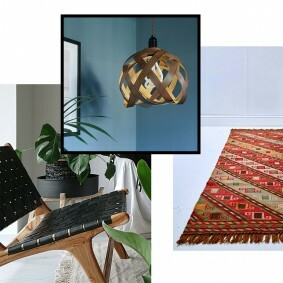 They’ve conquered supperclubs and cookbooks – and now they’ve designed a homeware range, too. Delphine Chui talks to them about taste and style. Decorating a kitchen is a multi-faceted job. Not only do you need to think about colour schemes, tabletops and sink finishes – you also need to envisage what you’re going to want your dining table to say about you. What are your dinner party essentials? We love coloured glass because it can really make a table pop, even if you don’t have a tablecloth. We would always use our best crockery, and flowers or foliage are essential on a table to bring it to life. What’s your favourite table setting colour schemes? That depends on the season, in summer we like to use pastels and whites, we usually go to the big fabric shop in hackney and get £3 a metre linen and make our own tablecloth and matching napkins – way cheaper than buying them! In the Autumn we love more earthier tones like mustard and racing green. Don’t be afraid to experiment with colour on your table, but the only big no no for us are dark coloured plates – it never works well with any food you are serving! What are your rules when laying a dining table? We don’t really have set ‘rules’ as it depends what you are trying to create with your table, you could go full on maximalism (think Le Double J) so the rules on this would be to just go for it! 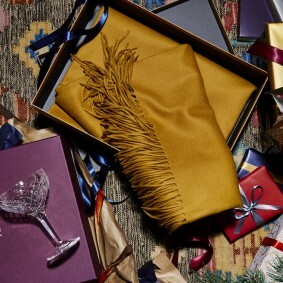 Print on print, lots of colour, big flowers, gold napkins rings and coloured glass – for this more really is more and don’t be afraid of clashing colours or prints. Or you could do something very clean and St Johns – and the rules for this are just pure simplicity, white table cloth, with matching white linen napkins, silver cutlery, white china and clear glassware. 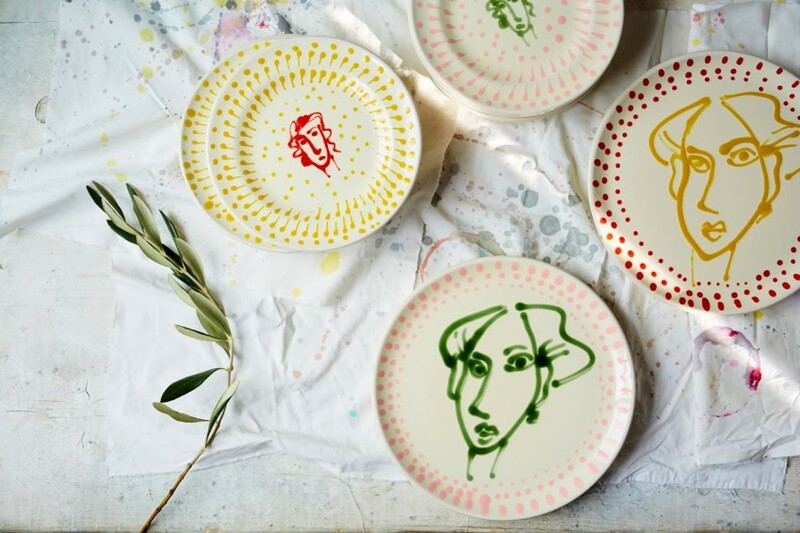 What do you love about colourful ceramics? We love the sheer joy of seeing something so bright and wonderful on the dining table. Having simple linen brings the colourful ceramics to life. 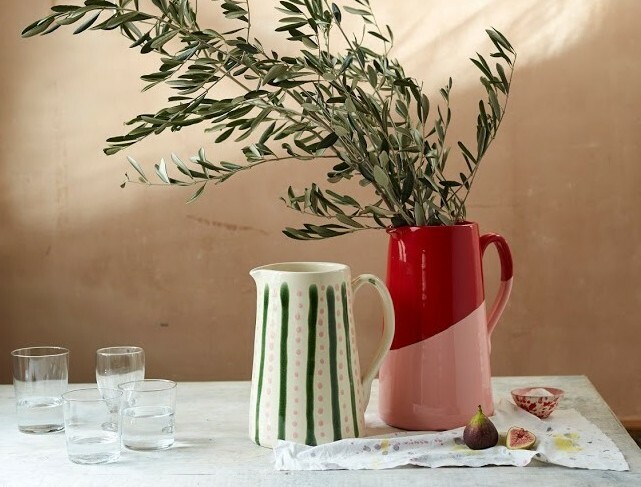 We have been collecting ceramics from our travels for many years and the bright pieces always seem to stand out and catch our eye in the markets and shops we travel to. Our suitcase is usually over weight on a return flight after a holiday! What tableware should every household have? A really simple white linen tablecloth with matching napkins is a must, if you ever get bored of them being white you can always dye them another colour. 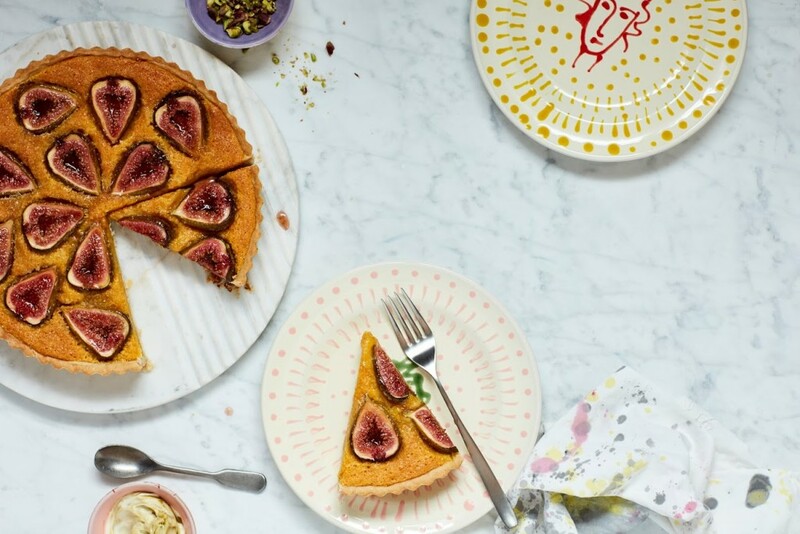 Having some timeless crockery for best, and some really beautiful glassware will stand the test of time, then you can interweave with some more fun, playful tableware pieces like face plates, cocktail jugs and pinch pots you can make a more trend led tablescape. We also couldn’t live without simple candlesticks, and you can change up your candle colour every dinner party- we love Ester and Erik taper candles and Matilda Goad scallop pastel candles. Mini glass vases for the table are very handy indeed, I mean this list could go on, and on! What’s your interior style like at your respective homes? L: We both have quite different tastes at home, Alice has the most beautiful apartment which is quite Danish, it has very high ceilings and white washed walls with pops of colour being a fabulous green velvet Habitat sofa and a lovely pastel pistachio kitchen. I live in an old Victorian house with floral William Morris wallpaper everywhere and would say I am a lot chintzier than Alice. I am currently going through a major refurbishment so I’m still yet undecided on some of the spaces in the house. What’s your favourite piece of furniture you own and why? A: I love my Bauer dining room chairs – I stole a couple from my mum and dad’s old set and then made up the rest with eBay finds. L: I have to say it’s my bed, I spend so much time sleeping that it was important to have somewhere that was comfortable yet chic. I had the headboard and valance made in a ticking stripe, and it’s a little higher than a ‘normal bed’ which I love! How did art influence your designs for Habitat? We both love the figurative designs of Picasso and Henri Matisse, we especially love ‘portrait of a woman’ by Matisse and used that as our inspiration for the faceplates. It was important that the faceplates were women, but also had a J&L twist. We visited the Picasso museum in Barcelona too, so we could study his ceramics as well as his art. 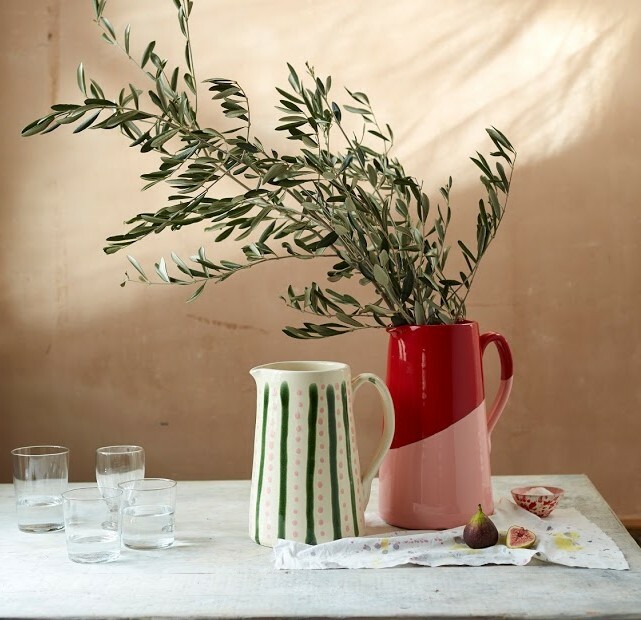 The colour palette of the collection were greatly inspired by Wes Anderson movie sets, we loved the colour combinations from the ‘Grand Budapest Hotel.’ The red and pink jug was a colour way we spotted in a photograph of a fire station on the Instagram account @accidentallywesanderson. How did you start designing these? We were very lucky to work with the head designer at Habitat, Martha Coates. Martha is such an intelligent, smart and creative designer. When we took our endless tear sheets, mood boards and colour ways she helped us sieve out the best bits and translate that to the J&L and habitat customer. The process took about a year of meetings and creative back and forth, but we finally struck gold when we found the factory we wanted to work with in Puglia, called Fasano – this incredible factory has been making ceramics for over 50 years. 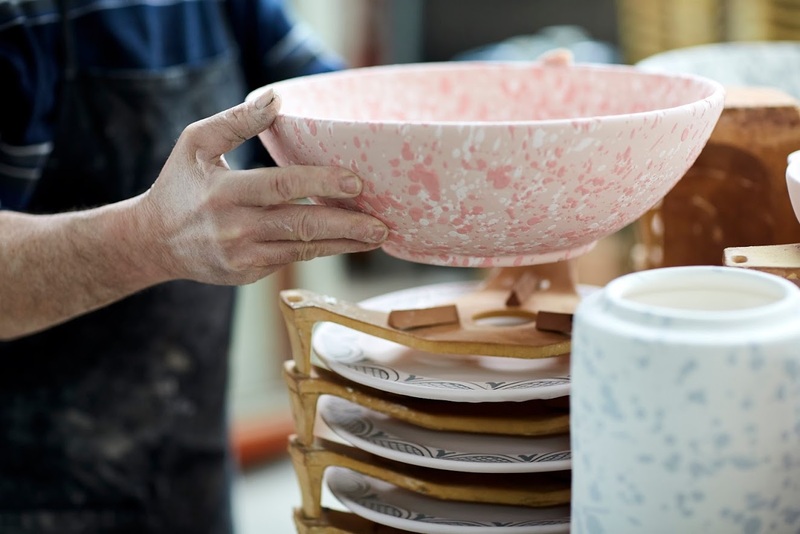 We went out to Italy to see the samples being made, and witnessed how each plate is individually hand painted, and each splatter bowl / plate is hand splattered. It was a great experience to see each piece being made with such great care and attention to detail. Living in London we are surrounded by so much inspiration, a new restaurant, hotel or cafe opening usually comes with the chicest decor. We have beautiful museums like the V&A which give us hours of tile inspo and of course Instagram – we love a good house stalk thought the interior hashtags. We are currently obsessed with the rose quartz sinks in the new Annabels! What interior style do you admire most? A – I really love the work of interior designers Salvesen Graham – amazing use of pattern and colour, showing that you don’t need to be minimalist to create really serene and calming spaces. L- I like a really wide landscape of design and interior style, I love Robert Kime and old English layered textures which is more suited to my house, but I also have a real soft spot for 1970’s LA architecture. I also really like the New York apartment of John Derian and I don’t think I’ll ever get bored of looking at masterpieces by Tony Duqette. What do you love most about Italian style? It’s effortlessly chic! It’s colourful, playful and timeless. We secretly wish we were Italian! Why do you love the speckled paint effect so much? It’s such a classic design but we played around with the colours, using clashing colour ways like khaki and mustard, red and pink enabled us to modernise but within the perimeters of the traditional print. How did you decide on the ‘face’ for your plates? Well we had so much inspiration from the like of Picasso, but we worked with Martha who is the head designer at habitat to make it feminine and have a J&L touch. Martha really brought to life our scribbles and mood board and created something we really love. We feel the plates are so timeless.